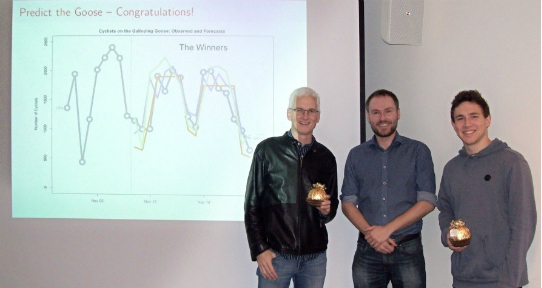 Congratulations to UVic economics students Bryce Edwards & Mathieu Weary as well as Dr. Martin Farnham on winning the first `Predict the Goose’ competition! 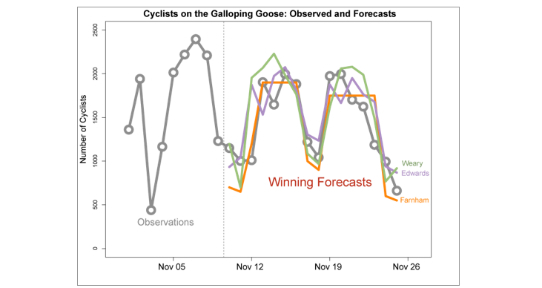 The competition invited students and faculty to forecast the number of daily cyclists on the Victoria Galloping Goose trail more than two weeks into the future and was organised as part of the UVic’s graduate time series econometrics course taught by Dr Felix Pretis. The winning entries used methods based on historical averages combined with expert judgment, exponential smoothing, as well as dynamic models taking weather forecasts into account. The winning entries accurately predicted the thousands of cyclists using the trail each day, with an average forecast error of only 15%.